Graduations for civilians and members of the Armed Forces around the world. Graduations are around the corner, and you may find yourself throwing an outdoor graduation party for your soon-to-be graduate. There are some things that you need to do ahead of time to insure a successful event. You can use formal announcements that you have ordered through the school and insert a card with the graduation party information on it. Also be sure to request an RSVP, so you can get an idea what the head count will be. With all the card making software, it is easy and inexpensive to design a custom graduations party invitation. You can also design your own announcements too. Send them out a month in advance, so people can reserve that date on their calendar. Since you can’t control the weather, borrow or rent tent canopies that you can use for shade or as a rain shelter. Borrow tables and chairs from your church or from the neighbors. Get plastic runners in the school colors from a wedding supply store. These will be your table cloths. Centerpieces can be as easy as flowers in clay pots that coordinate with the colors. Spruce it up with ribbons to match. Another idea is to make paper die cut flowers in graduation scrapbook paper. They can be placed in cute containers for the table. You can order balloons or lollipops customized with your son’s name and graduations date on them. There should be a special table set up with your son’s photos from his school years and earlier. You can also make a scrapbook of all his achievements, or you can even publish a book through self- publishing sites like Blurb. Be sure to have a basket or box available for the gifts and graduation cards. For the menu, you can do something easy like BBQ pulled pork sandwiches. Cut the pork loin up and slow cook it in crock pots or a roaster. Use small rolls for the buns. Also BBQ baked beans are easy to make in crock pots and serve. Offer 2 or 3 salads like pasta and potato salads. Have a fruit and vegetable spread. Place salad bowls and dips into a small inflatable kiddie pool filled with ice to keep it cold. Order your graduation cake in plenty of time for the party. If you are environmentally- conscious, have a large water jug for people and one for lemonade. You can also have a cooler filled with an assortment of pop. Throwing a great outdoor graduation party doesn’t have to be difficult. If you are organized and have friends and relatives helping, it can be a wonderful send-off for your graduate. Graduation gifts can be personalized with the young person’s name and date of graduation. We have a select range of military rings and family crest rings which are very suitable for the special occasion. It is important to remember to order these items early as there is a lead in time for all custom gifts. 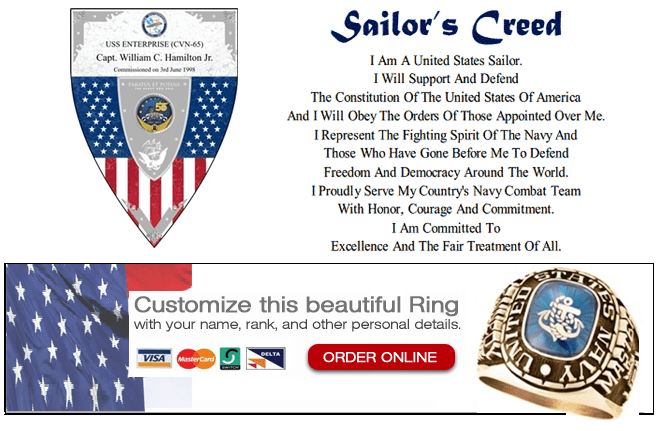 Order your custom military rings here. Simply click on the image and you will arrive at the customization area. Great United States Navy Gifts of Pride !